What if you had an effect in hardware that acted like tape – with tape heads, adjustable speed, and so on? But what if that tape were … digital, instead of analog? And what if it were run by a … robot? And sequenced? Wait, huh? Well, step again into the wacky imagination of Bastl Instruments. They showed off an early prototype of this concept back in 2015, only to have the hardware go off the radar for a while. Now, it’s back in a more or less completed instrument, one that delivers on that early potential. It’s called Thyme. Even after just a short play, Thyme looks like it might be worth the wait. It’s possibly the most sophisticated design from Bastl to date. 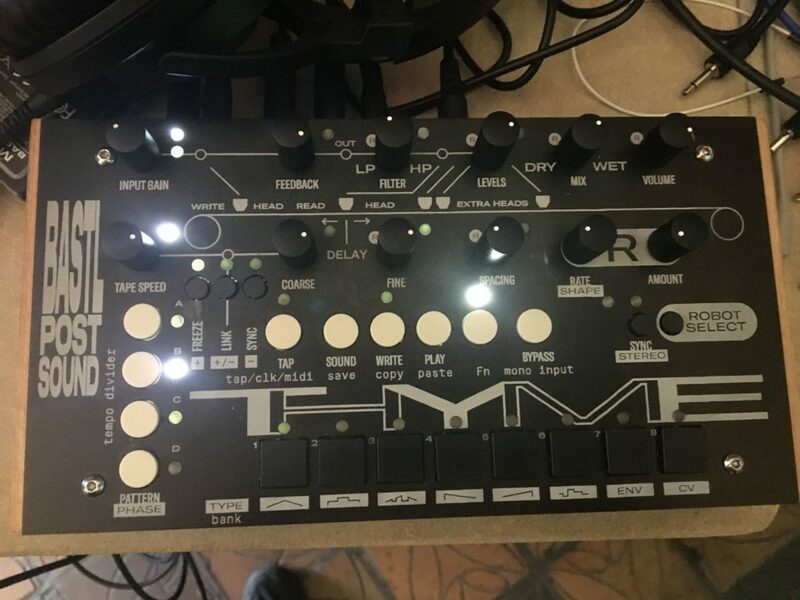 Whereas modules and desktop hardware from Bastl have mostly focused on cheap, playful ideas, Thyme is a fairly advanced effect with loads of functionality. While I can’t repeat the price estimate, I think it’s also fair to say this will be at a higher price point than Bastl’s existing desktop gear. A lot of these sounds originally arose out of tape techniques in the first place. What Bastl have done is to reorganize all those same temporal effects around a tape interface. Some of those (like delay) work in ways that obviously come out of analog tape. Others work in more digital-sounding ways, performing sonic feats that would normally be impossible with tape. And, this being a Bastl instrument, you can push the envelope of digital sounds to get crunchy, bit-degraded digital extremes if you want – though you can also get some gorgeous, ringing textures, too. For those who love aliased timbres, it might just be a must-buy. And while some of these things are possible in hardware, it’s just terrific to have physical controls in this layout. It feels like an instrument right away – with the knobs themselves arrayed where tape capstans normally would be. And then there’s the requisite wet/dry control. In addition to dialing these in directly, you can modulate them via LFO (with various waveshapes, selectable by push-button), external CV, or an envelope follower. The envelope follower lets the dynamics of the signal modulate the result, and open up treating the whole thing as a kind of dynamics processor, too. These various modulation sources are what Bastl have slightly charmingly called the “robot” – but you can also think of this as powerful modulation. To this, Bastl have added buttons on the bottom, which serve both as preset storage and recall and step sequencing. So you can simply tap on a preset you want when you need it, or you can make elaborate series of sequenced effects by arranging patterns from those presets. I was particularly impressed that in my brief test, extreme changes between presets didn’t stop the Thyme from shifting from one setting to another seamlessly. All in all, though, I think it’s some seriously clever stuff. And to anyone complaining that there were “no new ideas” at Superbooth, I’m impressed that you couldn’t get past the entryway without stumbling across two very new ideas from Bastl. It’s true that a lot of the Eurorack phenomenon is, by its very nature and economy, variations on a theme. But that doesn’t mean there isn’t room for fresh perspectives in electronic music hardware, generally – and we can count on Brno’s scene of inventors to shake things up. I can’t wait for this one to arrive. Oh yeah, and for history’s sake – flashback to 2015 and the earlier prototype. The concept was there, but not fully fleshed out. This isn’t just two years waiting for refinement; clearly, in those two years, they really developed what the hardware was about.